For every great name in astronomy — people like Johannes Kepler, Galileo Galilei, Isaac Newton and Nicolaus Copernicus — there are others who are not so well known, but who still managed to leave their mark. One of these did so by mapping out star patterns in the sky still recognized today, hundreds of years later. Nicolas-Louis de Lacaille (1713-1762) is considered a pioneer in astronomy. Between 1751 and 1754, he traveled from his native France to South Africa to survey the skies invisible from his homeland. He was stationed at the Cape of Good Hope, where he catalogued the positions of 9,766 southern stars in just 11 months. What is truly amazing is that he did all of this with a little 8-power refracting telescope measuring only 26 inches (66 centimeters) long and just 0.5 inches (1.3 cm) in diameter! 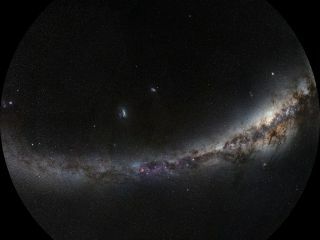 In fact, two of the stars he catalogued — both of which are of 7th magnitude, just below the threshold of naked-eye visibility — are now known to be among our nearest stellar neighbors, at distances of 12 light-years or so. Unlike many of the larger, brighter constellations, which were chiefly based on mythology and legend, Lacaille chose to fill uncharted areas of the southern sky with new constellations representing inanimate objects — apparently a personal resolution he made to honor craftsmen by their tools and inventions. One of these constellations is visible now in our late-evening sky: Antlia Pneumatica, the Air Pump, which Lacaille created around 1750 to honor Otto von Guericke, who invented the vacuum pump in 1650. Despite being composed chiefly of dim, faint stars, the pattern is still on the official list of 88 constellations recognized by the International Astronomical Union, though its name has since been shortened simply to Antlia, the Pump. Lacaille also mapped out the Pendulum Clock, or Horologium, to honor the device's inventor, Dutch scientist and mathematiciam Christiaan Huygens. Huygens was also the first person to discern that Saturn does not resemble a pot with handles, as Galileo described it, but rather has a system of rings. Two of Lacaille’s star patterns — the Mariner’s Compass (Pyxis Nautica) and Ship's Mast (Malus) — were incorporated into Ptolemy's oversized and now defunct constellation of Argo Navis, the mighty ship that belonged to Jason and the Argonauts. Only Pyxis Nautica is still recognized to this day. Ironically, it probably would have been more appropriate to have kept the star pattern Malus. Argo Navis certainly had a mast, but the Argonauts lacked a compass. In addition to Antlia and Horologium, Lacaille’s constellations include a Sculptor’s Chisel (Caela Sculptoris), The Draftsman’s Compass (Circinus), a Chemical Furnace (Fornax Chemica), a Carpenter’s Square (Norma), Hadley’s Octant (Octans Hadleianus), a Painter’s Easel (Equuleus Pictoris), a Sculptor’s Workshop (Apparatus Sculptoris), a Microscope (Microscopium) and a Telescope (Telescopium). Reticulum Rhomboidalis, a Rhomboidal Net (now known simply as Reticulum, the Net), is a bit confusing, being sometimes associated with the reticle of Lacaille's transit instrument. Yet Isaak Nabrecht, who from 1540 to 1574 built the second of the three astronomical clocks at Strasbourg Cathedral in France, had earlier suggested a similar figure, Rhombus, in the same part of the sky. Lastly, there is Mons Mensae, known today simply as Mensa. The Latin word "mensa" translates as table, but it actually signifies Table Mountain at the Cape of Good Hope, which overlooked Lacaille's observatory. The flat-top summit is 3,500 feet (1,067 meters) high, where often a "tablecloth" of dense clouds formed. Is it little wonder that when the American astronomer Heber D. Curtis (1872-1942) journeyed to Chile to man Lick Observatory's southern station, he saw a star chart depicting all of Lacaille’s creations and exclaimed: "It looks like somebody’s attic!" But this odd collection of clocks, microscopes, easels and chisels will always be a reminder to constellation viewers of this enthusiastic French astronomer who has rightly been called "the Columbus of the starry southern skies."